Scientists aim to determine whether or not the universe is a two-dimensional holographic illusion using a device called the Holometer. 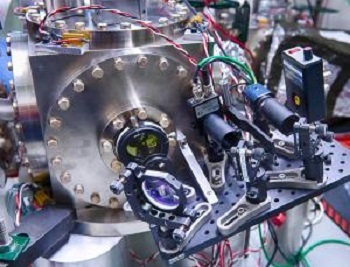 Physicists at the Fermi National Accelerator Laboratory near Chicago, Illinois, announced this week that a device designed to test whether we live in a giant hologram- aptly named the Holometer- has started taking data. The device is assisting in an experiment that tests a theory that the universe is actually made up of tiny "bits", similar to how a photo in a newspaper or an old school comic book panel is made up of tiny, individually colored dots. These fundamental units of space and time (if they exist) would be incredibly tiny- a hundred billion billion times smaller than a proton. Instead of acting in the way normal particles do, "bits" would behave more like waves due to the quantum behaviour of matter and energy. "The theory is that space is made of waves instead of points, that everything is a little jittery, and never sits still," said the brains behind the experiment Craig Hogan, from the University of Chicago. The Holometer is designed to measure said "jitter". The device consists of two powerful laser beams, with both directed through tubes 40 metres long. The lasers precisely measure the positions of mirrors along their paths at two points in time. If space-time is smooth and demonstrates no quantum behaviour, then the mirrors should stay perfectly still. However, if both lasers measure an identical difference in the mirrors' position over time, it could mean the mirrors are being jostled about by fluctuations in the fabric of space itself. The theory that the universe is made of these units comes from the belief that information cannot be destroyed, and that something similar to the 2D event horizon of a black hole "records" everything that gets pulled into it. If said notion is true, the boundary of the universe could also create a 2D representation of all things contained within the universe- like a hologram storing a 3D image in 2D. What are your thoughts concerning this experiment? Be sure to leave us a comment, and check out more Science-y news right here at The Escapist!